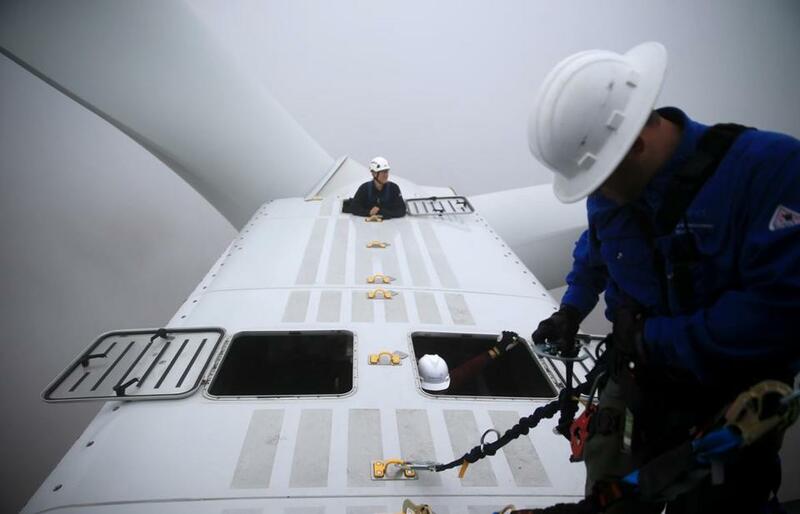 First Wind employees worked at a turbine at the Bull Hill Wind Farm in Lincoln, Maine. First Wind Holdings Inc., a dominant player in New England’s wind energy industry, has sustained legal setbacks in Maine that threaten some of the Boston-based developer’s proposed projects there. First Wind owns or operates wind farms on 12 sites in six states, including five locations in Maine capable of generating enough power for 90,000 homes. Efforts to expand recently have met hurdles. The latest comes from the Maine Board of Environmental Protection. Earlier this month, it upheld a decision by state regulators to deny a permit for a 16-turbine, 48-megawatt project that First Wind had hoped to build on Bowers Mountain in a remote section near the border with New Brunswick, Canada. Allowing the Bowers wind farm, the board determined, would adversely affect the views around nine scenic lakes considered of “state or national significance,” said Cynthia S. Bertocci, executive analyst for the board. First Wind spokesman John Lamontagne said the company is “very disappointed” by the board’s decision. First Wind could appeal to Maine’s Supreme Judicial Court. In March, the Maine Supreme Judicial Court vacated the state Public Utility Commission’s approval of a deal that included a joint venture under which First Wind hoped to build several wind farms in Maine, Vermont, and New York. The proposed partnership with the Nova Scotia-based Emera Inc., the parent company of Bangor Hydro-Electric Co. and several other utilities, was sent back to the Maine Public Utility Commission for further review. Lamontagne said First Wind remains “very hopeful” that the joint venture will ultimately be approved, particularly after the state’s public advocate, who represents ratepayers, reversed his office’s previous position and decided to support the deal. The recent decisions from regulators and the court, Lamontagne added, have no impact on other First Wind projects under development. A 51-megawatt farm has been permitted while a 147-megawatt project in Aroostoock County has started construction. In Utah, First Wind recently finalized deals under which the power produced by a planned 320-megawatt solar development will be purchased by the utility Rocky Mountain Power, a division of PacifiCorp and part of Berkshire Hathaway Energy. The company began developing solar projects about a year ago and recently completed two Massachusetts installations, in Warren and Millbury. The Utah development, a combination of four sites in Beaver and Iron counties, is expected to generate enough power for 90,000 homes. Construction is scheduled to begin next year. The anti-wind-power group Friends of Maine’s Mountain applauded the setbacks to First Wind, which they view as an “aggressive” developer of expensive projects. Christopher O’Neil, a spokesman for the advocacy group, said the organization believes wind energy will ultimately prove economically uncompetitive as New England states begin to use more hydropower from Canada and domestically drilled natural gas from Pennsylvania. “When those two things happen,” O’Neil said, “First Wind is likely to go the way of the Pet Rock,” making a reference to a 1970s fad.